There are few moments as blissful as when the airplane cabin door closes and you realize you've lucked out with an empty seat beside you. Who doesn't love some extra elbow room and carry-on stash space? However, as lovely as having a row to yourself on a cross-country flight may be, it also means you're probably missing out on a meet-cute with your soulmate, because according to a recent study, an astounding one in 50 travelers will end up finding the love of their life on an airplane. The surprising statistic comes from a new market research survey conducted in July by HSBC Bank, which asked more than 5,000 travelers around the world about their in-flight experiences in an effort to get insights on the 11.9 million people who fly every day around the world, according to Travel + Leisure. Specifically, the survey consulted people from 141 different countries, and found that one in 50 people reports having met the love of their life while on an airplane. That means, if you're flying in a 737 filled with a bunch of other frequent air travelers, there's a pretty good chance that about four people on board met their soulmate inside a metal tube soaring through the skies at 30,000 feet. 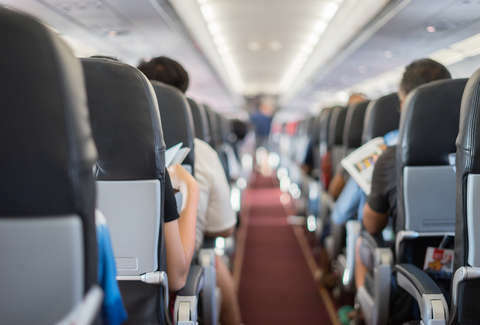 Additionally, the survey found that a surprising number of travelers have made meaningful non-romantic connections during a flight. As many as 14% report to have made a long-lasting friendship with someone they chatted with on plane, and 16% claim to have forged a business connection doing the same. The skies are evidently a pretty friendly place overall, too, with 51% reporting to have at least once started a conversation with a stranger on a plane. Though, as exciting as the prospect of settling down for good with your next potential seat mate may be, let's be real: flying can also be a hellish nightmare. It's probably just as likely that the person who plops themselves down next to you on your next flight is violently flatulent, or even a secret poop-smearer. Then again, who's to say, you might end up meeting someone you want to join the mile high club with!